Clockwise from left: Fabian Reese (Schalke), Aaron Seydel (Mainz), Kai Havertz (Leverkusen), Renato Sanches (Bayern), Emre Mor (Dortmund). 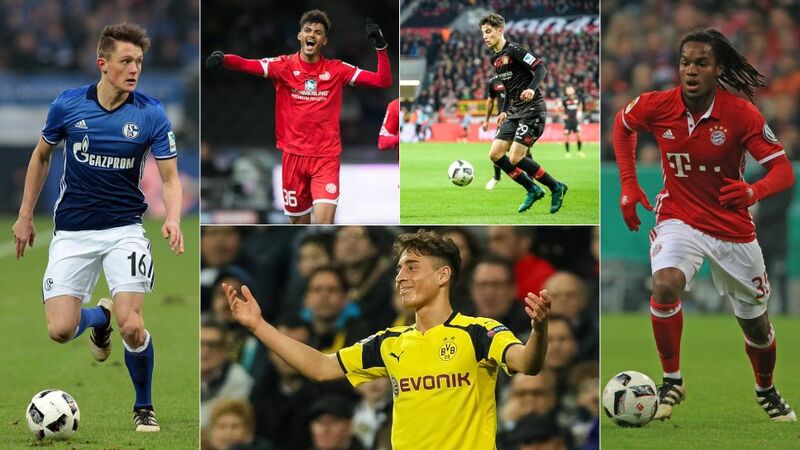 The Bundesliga's long-standing reputation as a fertile breeding ground for exciting young players has been further cemented this season with the emergence of several gifted youngsters. Make the most of unlimited transfers to get your Official Fantasy Bundesliga team in shape for Matchday 17 here! Bayern beat off stiff competition to secure the signature of Renato Sanches, who shone in a Portugal side that won UEFA EURO 2016 in France last summer. The 19-year-old midfielder's impressive composure on the ball, passing ability and raw power have earned him widespread praise and although he has only made four Bundesliga starts this season, he does not look out of place alongside Thiago, Arturo Vidal and Xabi Alonso in Bayern's midfield. Sanches already looks the real deal, and has plenty of time on his side in Bavaria. Mor was only at FC Nordsjaelland for half a year before former Dortmund coach Otto Addo, now at the Danish side, recommended him to BVB. Thomas Tuchel was quick to accept the offer, and while the 19-year-old has been limited to seven Bundesliga outings so far this term, his pace, close control and willingness to take on his marker have injected further excitement and unpredictability into Dortmund's game. Mor even scored on his Bundesliga debut in an emphatic 6-0 win at home to SV Darmstadt 98, and with Pierre-Emerick Aubameyang will be at the Africa Cup of Nations this January, it could be the perfect opportunity for Mor to make his mark in midfield. A precocious attacking midfield talent, Havertz made his Bundesliga debut in his side's 2-1 defeat at SV Werder Bremen on Matchday 7. His first top-flight start followed soon after: the 17-year-old played 90 minutes and impressed in a 3-2 win against Darmstadt on Matchday 10. Roger Schmidt continued to thrust the youngster into the fray throughout the Hinrunde and was rewarded when Havertz picked up his first assist in the derby against 1. FC Köln on Matchday 16, teeing up Wendell to score the equaliser in a 1-1 draw at the RheinEnergieSTADION. Standing out for his balance, fine decision-making under pressure and clever movement between the lines, Havertz is set to grow in importance for Die Werkself after the winter break. Reese's goalscoring abilities have been turning heads since he joined Schalke as a 15-year-old in 2013. Now 19, the striker is on the fringes of the first team having plundered goal after goal in the Royal-Blues' youth teams, including three this season in the Regionalliga, Germany's fourth tier. Reese made his Bundesliga debut last season, but has started to make a real impression this season, featuring three times in the top flight, once in the DFB Cup and twice in the UEFA Europa League. Judging by his prolific record in front of goal at youth levels, a first senior goal is not too far off. Seydel left quite an impression on his Bundesliga debut: the 20-year-old, who has been at Mainz since he was nine, scored in a 2-1 defeat at Hertha Berlin with his first-ever shot in the top flight. The tall, powerful forward's impression in only three games of the Hinrunde was such that the club saw fit to award him his maiden professional contract. Seydel recently put pen to paper on a deal until 2021 with the Karnevalsverein, with Mainz sporting director Rouven Schröder saying: "As well as his footballing ability, his size makes him a very interesting player who we're delighted to have in our squad." Click here to vote for your team of the Hinrunde!